February 3, 2010 (San Diego’s East County) – The filing deadline for some November races is just days away. Four Republicans have announced intentions to run for the 77th Assembly District currently held by Joel Anderson, but thus far no Democrat has thrown a hat in the ring. Likewise, Congressman Hunter faces an easy coast to victory for reelection this fall, since there’s no Democratic opponent for his seat, either. Many local seats including city councils, mayors, as well as school, planning, water and fire boards also have only Republican candidates--or vacancies with no candidates at all. Why aren't more Democrats running? That’s not for lack of effort. Democratic recruiters have interviewed numerous prospects, asked current office holders to recommend qualified candidates, hosted a candidate recruitment fair, and more. But Democrats tend to be working people--not wealthy corporate fat cats. With the economy still weak, many would-be Democratic candidates have told candidate recruiters that they need to tend to their businesses or jobs. So they lack time or money to run. What does it take to run--and what are the rewards? We are seeking Democrats for positions on the ballot this year who support the principles of the Democratic Party and who want to serve their communities,” says Bonnie Price, chair of the Party’s candidate recruitment committee in East County. Some local elected offices pay modest stipends—and some higher offices offer hefty salaries. Running for state legislative or Congressional seats is expensive. But contrary to popular belief, many smaller local races have been won on shoestring budgets—in some cases, only a few hundred dollars. Political parties seek to have candidates for every race on the ballot, however, since even long-shots with little money or name recognition have been known to win if an opponent becomes caught up in a scandal, dies or becomes disabled, or withdraws from the race due to illness. Candidates must pay a filing fee and getting voters to sign a petition to get you on the ballot. With smaller officers, the number of signatures can be small – a few dozen. Higher offices allow candidates to offset all or a portion of filing fees if you get a large number of signatures. Democratic insiders in past years have helped cash-strapped candidates by hosting petition signing parties, finding donors to help cover filing costs, and other means. Petitions are available now for most offices – and February 25th is the deadline to turn in signatures for many important races. Candidates are advised to collect more signatures than needed, since some are invariably thrown out for unreadable or inaccurate information, voters who sign in the wrong district, or other reasons. Besides Congress and Assembly, what other seats need candidates? Democrats seek candidates for partisan offices as well as nonpartisan races (where party affiliation is not listed on the ballot, such as in school board races and city councils). One Democrat, Paul Clay, has voiced intent to run for the State Senate, where he may face off against Assemblyman Joel Anderson, who is widely believed ready to announce plans for a state Senate race. Clay, a teacher, ran for the seat previously with little financial backing, but hopes for better backing this time if he squares off against Anderson, who has been plagued by campaign finance controversies and was fined by the Fair Political Practices Commissions. Some area school boards and smaller commissions have Democrats in the race. But to date, no Democrats have stepped forward to challenge any of East County’s mayors. Nor are there any Democrats cofirmed up to run for council seats this term in El Cajon, La Mesa, or Santee. Democrats believe a viable candidate could pick up a board on the El Cajon council, which has faced controversy over issues such as boarded up busineses in the downtown district, closure of the performing arts center, and more. There are also no Democrats running yet for the Grossmont Union-High School Board or the La Mesa-Spring Valley School Board, two boards that have been mired in controversies in recent years, to name just a few key positions that Democratic leaders express frustration over being unable to fill thus far. There are also seats on many other boards and commissions, such as water, fire, and planning boards. No Democrat has announced to run against incumbent Republican Dianne Jacob, though odds of an upset victory in that race are steep owing to Jacob's popularity even with many liberals for her stance against Sunrise Powerlink. What help does the party offer to candidates? The party helps approved candidates through party slate mailers and endorsements, links on the party website, precinct walkers from the Go Team, candidate training, and mentoring. For endorsement by the party, candidates fill out questionnaires and may be asked to meet with Democratic Central Committee representatives to assure that candidates reflect party values such as protecting rights of working people, families, women and minorities, strong public education, a clean and healthy environment. Why do Democrats think they can win in East County? The Democratic Party has made significant inroads into East County, traditionally a heavy Republican stronghold—and they believe that boots-on-the-ground campaigning coupled with Internet outreach makes it possible to reach many voters. A new Democratic “Go” team in East County now has 100 to 200 precinct captains—compared to zero just a couple of years ago. Barack Obama won about 46% of the vote in the 52nd Congressional District held by conservative Congressman Duncan Hunter. Democratic Club memberships have risen sharply over the past couple of years in East County. La Mesa flipped into the “blue” column last year with a majority of Democratic voters and party insiders predict El Cajon won’t be far behind. Councilman David Allan won reelection to La Mesa’s despite changing his registration from Republican to Democratic. 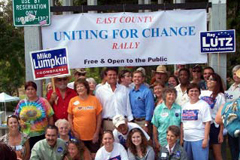 Plus Democrats picked up seats on several key school boards and commissions in East County in 2008 elections. Women candidates have been particularly successfully in San Diego County, which has two women state Senators and two Assemblywomen, all Democrats. Women candidates tend to draw 5% more votes on average than men, recruitment insiders say, and female pro-choice candidates can attract support from independent groups like Emily's List and Run, Women, Run. But without more East County candidates, many Democratic gains may erode – along with opportunities for Democrats to leverage popularity of President Barack Obama and elect more Democratic office holders in our region. Unlike Democrats, Republicans have had many years to develop a "farm team" for electing candidates to local offices and grooming them for higher ones. Often, Republicans have won handily simply by running unchallenged in those local races. Democrats hope to change that--but time is running out. If you are a Democrat interested in running for office, Price encourages you to contact her at bjbprice@hotmail.com. Some cities handle candidate filings within their local jursidictions; check with your city clerk if your comunity offices are not listed above. I am trying to provide my blog post with his statement, but your spam filter appears to be blocking url links. So, it is at www dot sdrostra dot com, then search for 77th Assembly District (I refer to only four previously announced GOP candidates, not five, as I have never seen any announcement from one of them, although the person has filed an intention to run). FYI, Jeff Kover dropped out of the assembly race on Monday, leaving four Republican candidates. Thanks, Barry. how come he dropped out? I changed the story to reflect this update. Incidentally, we'll be interviewing all the AD 77 candidates shortly. We decided to wait 'til filing deadline to see if the GOP herd would thin, if the Dems would field a candidate,and if Joel Anderson would decide to seek reelection.